It’s September! And I can’t quite believe that this is the 6th month we’ve been going! This month’s tale is well-known in principle, but in practice, I wonder how many people have actually read it beginning to end, and for how many it’s simply a phrase – ‘opening Pandora’s box’. I have to admit, until my son recently developed a fascination with Greek myths, I hadn’t read it start to finish, either, and the phrase isn’t nearly as common in my native German. What actually surprised me about the tale was Pandora herself, ‘made’ to be curious by the Gods. She couldn’t help it. I was struck by the inevitability of fate, if one accepts that whatever is, is because it was ‘designed’ that way. In the version of the tale I read, there was no need for apologies (‘Oops, sorry, I appear to have accidentally unleashed all sorts of evil unto the world’), no need for explanations (‘I just couldn’t help myself, guv’), and no need at all to take responsibility for one’s own actions (‘The Gods made me this way’). Thankfully, my three-year-old seems to have missed this particular loop-hole, or at least I’ve not heard it from him so far! The other thing that interests me is that Pandora unleashed all sorts of nastiness, and ‘Hope’ was the only thing left in the jar when she shut it again. What was hope doing with all the nasties in the first place? Did the story just focus on the bad, and in fact, Pandora let loose everything? Love, compassion, trust, as well as crime and poverty? And why did the tale I read my son finish with ‘as long as hope is still there in the jar, people know that things can always get better again’ – surely, for Hope to work, it needs to be out of the jar? Or do crime and poverty need to be let loose to influence us, yet hope needs to be kept under lock and key? That’s illogical, and annoying. So, in doing some more research, I found out that there are two versions of the story, as outlined here. It appears that they were conflated to non-sensical gibberish in my son’s storybook – which makes me grumpy – could they not be bothered to check the facts? 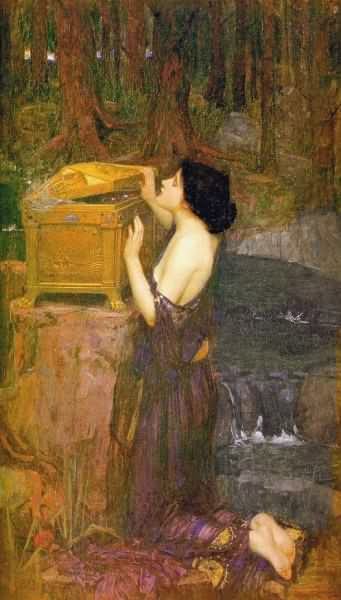 Anyway, whichever way you look at it I think the fact that ‘Hope’ features in Pandora’s Box is often forgotten. So, I thought I might do something ‘hopeful’…in whatever interpretation is easiest to tie in with what I need to do anyway, lol! This entry was posted in Pandora's Box, Thinking and tagged fate, gods, greek, hope, inevitability, interpretation, misery, myth, pandora, pandora's box, planning, sculpture, thinking. Bookmark the permalink.